“Every child is an artist,” wrote Pablo Picasso. “The problem is how to remain an artist once he grows up.” Much too often, the demands of making a living take precedence over the joys of making a statement and affecting social change through the creation of original artworks. When we mistakenly embrace a mindset that everything we do must be tied to compensation, there’s a tendency to become risk-averse, especially in a shaky economy. 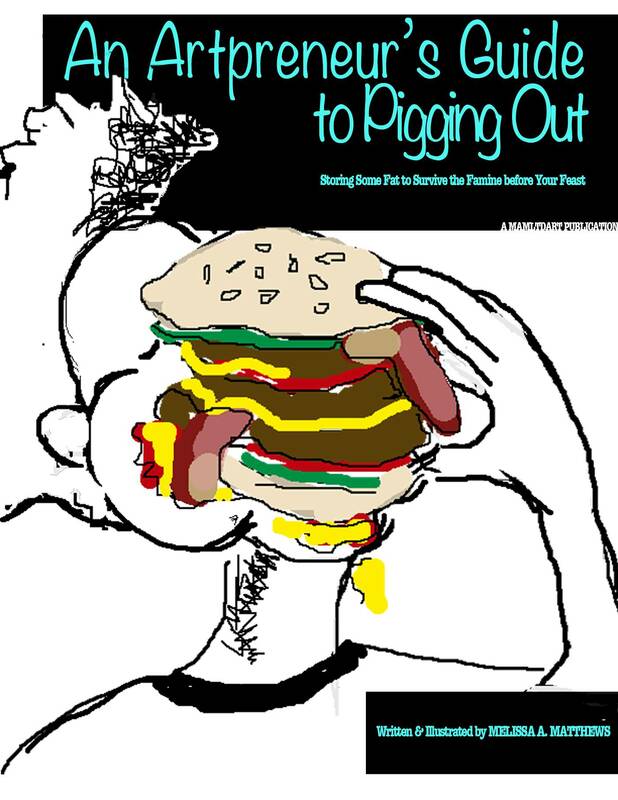 In her new book, An Artpreneur’s Guide to Pigging Out: Storing Some Fat to Survive the Famine Before Your Feast, author Melissa A. Matthews shares savvy advice on how to feed your muse, keep your bills paid, and turn your current struggles for recognition into a journey of personal empowerment. Q: Let’s start with some background on your journey to becoming a full-time artist and art consultant. Who or what, for instance, was the strongest influence on your decision to pursue your creative path? A: It wasn’t a cognizant decision. Discovering art in high school introduced me to a catharsis, I am not willing to give up. Every decision after that has kept me on this path. Q: What would you identify as your biggest “break-in” moment? A: I suppose my break-in moment as an artist came in January 2008. I was invited to be one of three artists exhibiting at a private show at the home of a former NBA player in Trenton, NJ. After, four years of university and working three plus jobs at any given time as a fulltime student studying painting which my mother so eloquently described as “aspiring to poverty,” I sold eight of the sixteen paintings I exhibited and walked away with roughly $6,000 in cash. It wasn’t the first time, I had sold work but it was the largest volume of work at one time and the only time my mother was able to witness firsthand that I could make a living at this “art thing”. It was an “aha” moment for her that has served our relationship well as she is now one of my biggest supporters. As a professional and a daughter, there is just nothing more validating than to make believers of your family. Q: “Art as a Lifestyle” is a wonderful tagline for your online shop, Mamltdart. How are you living this dream yourself in straddling two environments as culturally diverse as Washington, D.C. and Trinidad/Tobago? A: Well, having owned and operated MAMLTDART for just about nine years, (most of that time utilizing it as a part time income stream) I made a conscious decision in early 2012 to commit myself fully to the growth and development of my brand. This meant making a few sacrifices. I gave up my apartment in Cheverly, MD, sold as many of my earthly possessions as possible, booked a flight to Trinidad and embarked on a journey of embracing two sides of myself. I have always straddled these cultural environments being a first generation American whose family is inextricably tied to their home country. Trinidad has been ingrained in me as long as I have known myself and I touched its soil just six months after being born for the first time. Most of my art practice revolves around this twoness of being an American that isn’t so American and a Trinidadian that isn’t so Trinidadian. Therefore, shuttling between the two, physically is perhaps the most natural part of my journey as an artist. I couch surf in both countries; to keep costs down and ensure all my energy and money feed my business and develop my brand. I have managed to pull together a small support team that assists me in setting up exhibitions, staying current with my client base and developing new products and brand strategy. When I don’t have supplies, I work digitally on my small netbook computer. In the last year, I have created in excess of 150 pieces of art. I am constantly entrenched in creating, blogging, and engaging around art wherever I am. Art is my lifestyle. Q: What are some ways that creative types can affect social change in today’s world while they’re caught up in just trying to keep a roof over their heads and staying a step ahead of their creditors? A:. Social change is affected when people channel their passions in the direction of achieving common good. I started my career in the NGO/ Nonprofit sector, helping NGOs hone their branding and community outreach. As a consultant, I do project development and arts administration planning for arts based nonprofits. Every industry needs creative people; from graphic design to marketing to product, brand, and project development- creativity is a commodity Another way, creative people affect change is by being provocateurs, questioning the why, where, and how of the society they live in through whatever medium they are working in. Q: Define the difference between “wants” and “needs” and why entrepreneurs oftentimes make the wrong choice on which to focus their time and energy. A: Wants are those things that would make our lives easier— a ritzy apartment, a new instead of a used car, eating out, a $500 handbag and/or pair of shoes, a fancy studio. When in fact most people have the capacity to live and operate on much less than they think. Needs are those things that are NECESSARY for us to subsist and keep working –a roof over your head, something that takes you from point A to point B (feet do count), food with some nutritional value, any bag that holds your stuff and a place to work (Starbucks will do). Oftentimes people make the “wrong” or more extravagant choice because they don’t know any better. No one has told them that their work product is not a reflection of where it is created but of their knowledge and skillsets that could be aptly applied in any environment. When you focus on what you don’t have, you will always be in a state of lacking— your work will never be good enough because you don’t believe that your tools are good enough. Entrepreneurship is the choice between perfection and the idea of being perfectly imperfect. Successful entrepreneurs realize that the latter sets them apart in business. Q: The concept of barter has become a viable currency in our downward spiraling economy. What are some venues outside of the artistic community where the implementation of bartering would be effective in managing costs and resources? A: Bartering can be applied in almost in any situation. A good example of this would be food co-ops, giving a bit of your time for freshly grown and harvested produce. There are also cooperative workspaces wherein people lower the overhead costs by dividing the maintenance work amongst them and practice conservation techniques to keep energy costs low. The possibilities are really there for bartering and cost conservation in every field if you look close enough. Q: Arts programs are typically the first things to be cut in school programs. In your view, how does this diminish us as a society and what can be done to reverse the trend and make art more accessible to future generations? A: Art teaches a new way of seeing, examining the world around you, and relating to or empathizing with it. We are developing a generation of people that will lack the ability to think outside of the box. As a result, their problem solving capabilities, ability to conceptualize new and innovative ways of moving forward, and empathy will be lacking. This will leave us starved for new products, processes and perhaps most disheartening— leaders. Remedying this situation is as simple as outlining the role of art within other fields and making a concerted effort to teach arts integrated education. This will make for well-rounded individuals that can more easily understand the role of the arts, creativity, critical and imaginative thinking within a number of realms. Q: Has 21st century technology made it more – or less – hospitable for individuals to become entrepreneurs? A: I would say easier. Sitting within the confines of your own home, you can develop and run a web-based business be it ecommerce, counseling, a processing service, the possibilities are endless. Q: If a young person came to you and said, “I want to quit school and become an artist but my parents want me to go to college and get a ‘practical’ degree,” what would your advice be and why? A: I would first question why he/she felt that art was a field that denoted quitting school and encourage them to do their research. Tell them that any field worth being apart of is worth studying for. I would have them outline a plan for where and how they saw their art career evolving including education and post education plans as well as market research for the expansive ways in order to succeed with an art background. I would then have them present said plan to their parents. Parents are often worried about stability and once you can prove a solid career or financial stability is an achievable their worry is quelled. Q: What do you feel are some of the common attributes of successful entrepreneurs? A: Determination ( a “go get it” attitude), creativity, and failure— the ability to embrace failure as lessons learned and stay in pursuit of the ultimate goal. Q: Tell us about what inspired you to write An Artpreneur’s Guide to Pigging Out: Storing Some Fat to Survive the Famine Before Your Feast. A: I have been blogging for years. Sort of documenting my journey as a creative professional, and I started getting little notes from artists and non-artists alike telling me, that my posts were helpful to them. One day after going through quite a few blog posts, I had an epiphany, why not write a book for other people like me— artists, entrepreneurs, and people beating their own path. I’d read and absolutely love some great business books but none of them fit squarely in my box. I wanted to give people a realistic but still encouraging look on how to survive entrepreneurship, creativity as business and the like. Q: Did you work from a formal outline or just let the thoughts flow freely? A: I had a basic outline, taking a cue from the formatting I used in my blog but I basically free wrote the entire book over a day (it’s a short read) and then spent the next few weeks refining it. Q: Who is your target demographic and what do you feel is the book’s primary takeaway value? A: Entrepreneurs, artists, recent graduates, and the confused: people who aren’t quite sure what they want to do but are perhaps sure that conventional job paths may not be their thing. Q: Self-publishing is a popular trend these days but also requires that authors don multiple hats to successfully see a project through to completion. Why did you take this particular route and what do you know now that you didn’t know when you started? A: I took this path because as proven by my life, I enjoy a challenge. The thing I know now that I didn’t know as the beginning is that Epub formatting is an exercise in sadomasochism (just the most excruciatingly annoying process ever). Q: If a movie were made of your life, who should play you and why? A: That’s a tough one. Perhaps Quvenzhané Wallis when she gets a bit older. I absolutely adored her in Beasts of the Southern Wild. Q: In your own words, what is “failure” and how do people rise above it? A: Failure is finding a way that won’t work. Rising above it is dusting yourself off and finding a way that will work. Q: A sense of humor is critical in life as well as in business. How has your own sense of humor served you effectively as a professional? A: I try not to take my work or myself too seriously. Most of my gaffs and failures are well documented in my art. I’ve literally sold them. Q: What is the most surprising thing that your readers and followers don’t know about you? A: It’s a toss up between the fact that I’m 4’9/ 89lbs and I’m a twin. A: I have an exhibition opening in Maryland this June, continuing to produce the monthly illustrative zine, Overdrawn and I am writing the second installment of An Artpreneur’s Guide to Pigging Out this fall. Q: Where can people learn more about you and your work? A: You can find all my new work, musings on career and life on my blog mamltdart.tumblr.com and links to all my projects on mam-ltd-art.com.